Khaki Weed is a perennial herb with stems prostrate, rarely rising, sometimes rooting at the nodes, 10-50 cm long, hairy. 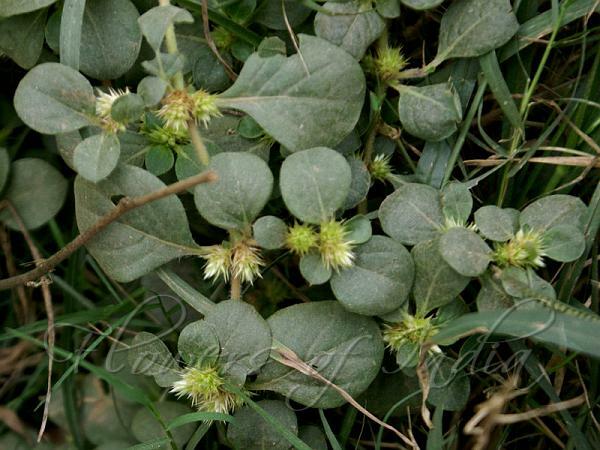 Leaves are ovate to obovate, 0.5-4.5 cm long, 0.3-2 cm broad, smooth to sparsely hairy, stalks 2-10 mm long. Flowers arise in stalkless, sparsely velvety spikes, bract about 4 mm long, tipped with a spine 2-3 mm long, bracteoles 3-4 mm long, acute. Sepals are unequal, the 2 lower ones 4-5 mm long, spine-tipped, the spine usually more than 2 mm long, other sepals not spine-tipped. Stamens are 5, all fertile. Fruit is 1.2-1.5 mm long, enclosed by the sepals. 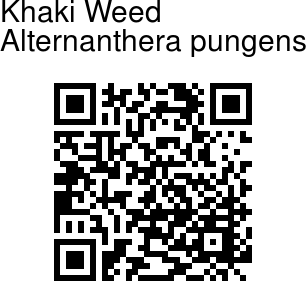 Khaki Weed is native to the American continents, naturalized in India.